Standard – one GPU renders both graphics + PhysX (not ideal as you’ll need a lot of GPU horsepower). 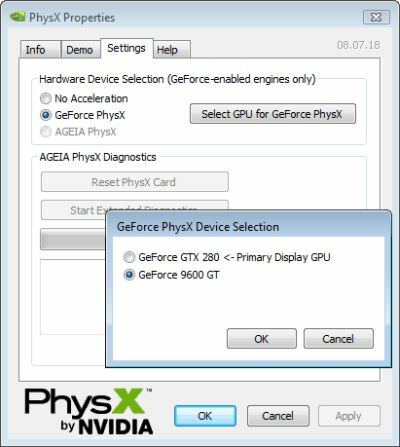 Now there’s a thing you will need to be aware of in the Multi GPU mode, it’s actually a Vista limitation but a second monitor must be attached to enable PhysX running on the second GeForce GPU. You must extend your Windows Vista desktop onto that monitor. To bypass that issue, most monitors have a standard VGA and a DVI connector, right? Just use both. This limitation is related to the Windows Vista display driver model (WDDM). This limitation does not exist in Windows XP. In NVIDIA’s upcoming drivers, they will be offering a workaround to improve the experience for Windows Vista users. With a single card or two cards in SLI mode you will not have this problem.